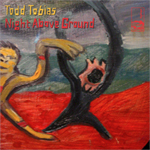 Free Companion EP to Todd's Medicine Show LP that was distributed via digital download only. From the Hidden Shoal Recordings Web Site: In contrast to MEDICINE SHOW'S serpentine construction and intense atmosphere, NIGHT ABOVE GROUND is more airy, accessible and playful, bursting into vivid life with the crowd chatter and tumbling noisescapes of �Invocation�. Immersive, hypnotic tracks such as �Crystal Palace People� alternate with brief, impressionistic pieces such as �Workshop of Spears� and �Ashes and Cream�. The EP�s 17 minutes flow past your third eye like a Dali-esque dream.